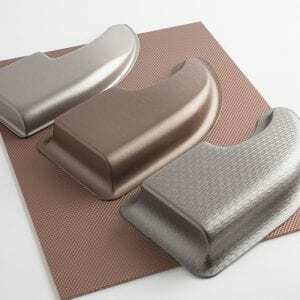 Thanks to our advanced calendering and press lamination technologies, we can permanently integrate a durable metallic layer incorporating real metallic flake with the color matched substrate for a deeper, richer metallic appearance. 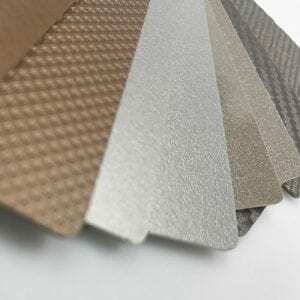 This means our Boltaron® 9815 M metallic sheet offers the best durability as well as outstanding scratch resistance – because the metallic flakes are embedded in the sheet, not just on the surface! When it comes to metallics, for us its not just a color effect – its in the material. 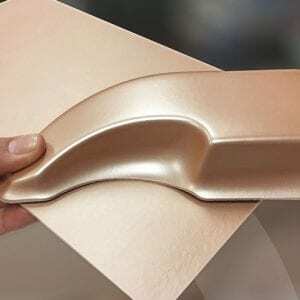 Metallic materials with unique pressed textures look amazing as thermoformed parts. Request a thermoformed material sample, as well as a color match sample to see how the material is transformed after the forming process.